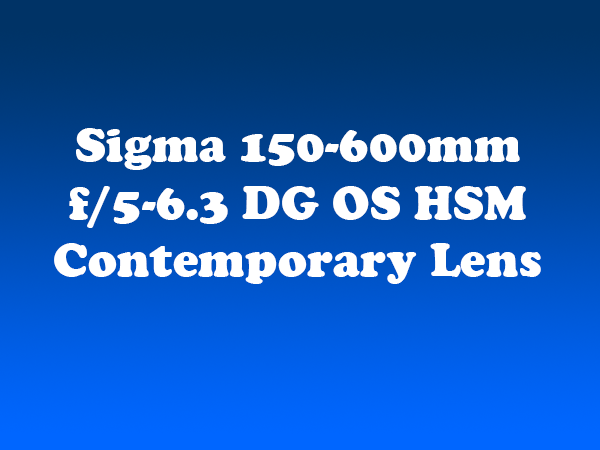 Sigma touts the 150-600mm f/5-6.3 DG OS HSM Contemporary lens as the perfect blend of both versatility and portability. Like its other recent additions, the 150-600mm f/5-6.3 DG OS HSM Contemporary lens features the quiet Hyper Sonic Motor (HSM) and new Optical Stabilizer (OS), with an accelerometer that makes it easier to seamlessly pan both vertically and horizontally. The Sigma 150-600 Contemporary also has a new zoom lock switch that can be used at any focal length, as well as a new manual override (MO) switch that improves focusing control. With regard to image quality, the only potential downsides are some chromatic aberration and minimal pincushion distortion. While the lens is lighter than many of its counterparts, it can still feel heavy when shooting for an extended period of time. Thus, even though you may not need a tripod for stabilization, you might want it anyway. As highlighted by NikonRumors.com, the Contemporary lens is largely a lighter, cheaper and slightly scaled-back version of the Sport model. The Contemporary model features 20 elements in 14 groups with 1 FLD lens and 2 SLD lenses, while the Sports version has 24 elements in 16 groups with 2 FLD and 3 SLD coated lenses. The Contemporary lens is also plastic rather than metal and is not weather-sealed like its higher priced counterpart, although the mount is splash proof and dust resistant. The 150-600mm f/5-6.3 DG OS HSM Contemporary lens retails for $1,089.00, which is nearly half the price of the Sport model. So if you can live without the weather sealing, the lens provides excellent value for the money. It is currently available for pre-order at Adorama and B&H.